Shelby, I haven't seen this on Facebook at all, and we have received no additional complaints about this specific issue yet. 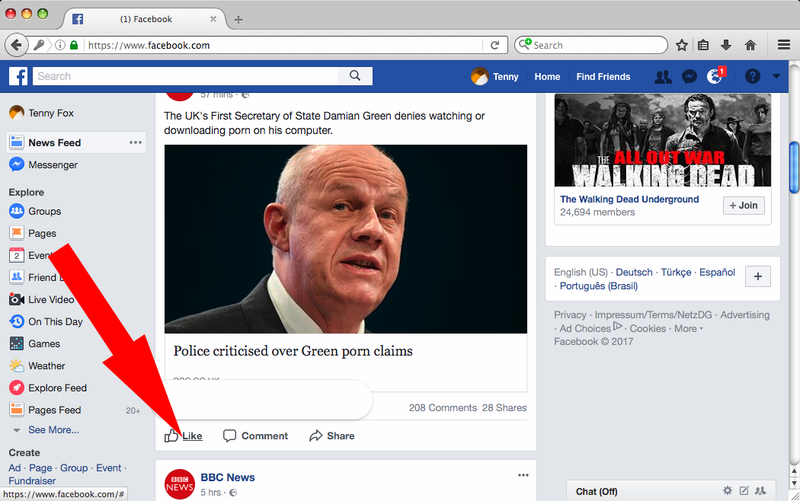 If the browser locks up every time you choose from the different 'like' options on Facebook (what you're seeing is not a crash per se), then there is something wrong with your installation or user account of TenFourFox. Note that re-installing the app alone does not change the user account, which stores your preferences, settings and add-ons. Go to Tools>Add-ons, disable all add-ons and re-start the browser. Then go to Preferences>Advanced>Network>Cached Web Content and click 'clear now'. Then try again on Facebook. of the OS and rather not. Is there system extensions to try removing? escape application and a reboot. But it's not a crash. No problem :-) You don't need to re-install your OS or remove system extension. Just do the steps for TenFourFox I mendtioned in the final paragraph of my answer and report back, please. Clearing the browser cache fixed it. I'm having the same problem. I've disabled all add-ons and cleared the cache, but the problem persists. I'm running the latest release (FPR 4). Dual processor G4, OS 10.5.8. With the newest version of TenFourBox my Facebook Box goes pinwheel as welll when I try to Like. Michael & Vid Hardt: Does it lock up right after you re-started TenFourFox or the FoxBox, or does it happen after you've used it for a long time without a re-start? It does it all the time for me. Even right after a cache clear and restart. The "fix" you gave worked once, but no longer works. click, so it basically takes 300 clicks to clear it completely!! The build is a mess. For clearing the cache: You need to click 'Empty' only once, then wait a while or just reload the pref pane after a while. The cache is clearing (slowly), only the pref pane doesn't update properly. This is a known bug. and set both preferences to false by double-clicking on them, then restart the browser and try again on Facebook. Chris (chtrusch) closed this discussion on 01 Dec, 2017 03:02 PM. My experience is identical to that of Shelbyism. Attached is a copy of the OSX error message. them both to FALSE but it made no difference. Ok .. well.. why doesn't it work for me? Should I reinstall and reset and retry?? It's worked now for me on more than one Facebook page. launching the bubble locks up my browser. Thanks for your attention, Chris. I'm happy to work with you to find a solution. I've 'liked' stuff excessively on Facebook the past day and was unable to reproduce the problem with my personal FB account. I can, however, reproduce it on another account (@Cameron: our test account!). The overlay that pops up when hovering over "Like" is used to choose different kinds of Likes (such as a heart or an angry face); the browser tries to load the emoticons and locks up instantly and completely, necessitating a force quit. Facebook continuously rolls out new features and doesn't do so for all accounts and countries at the same time. Therefore, the problem may spread to all other accounts over time, or it may just vanish, depending on who of us is on the newer version. I'll try to look into this over the weekend, but as usual with Facebook the culprit may be hard or impossible to find. Sigh. tenfour hasn't worked reliably on FB for 6 months now. TenFour works ok everywhere else. We all know it god dammit. If I create a new Firefox user account for each test I can reproduce the problem reliably in TFF 45.13.
facebook IM chat windows (to initiate a new chat with someone). I think shelbyism is right about Facebook; it's possessed by a malevolent and mischievous demon who delights in toying with us and wasting our time.